A former driver for Uber has sued the giant ride-hailing company in federal court, seeking unpaid overtime, tips and other payments on behalf of all current and former drivers in Wisconsin. The suit asks the court to "properly classify" Uber drivers as employees, not the independent contractors Uber says they are, a dispute in at least two dozen other lawsuits around the nation, and central to other companies' economic model in "the gig economy." Currently, the Milwaukee suit claims, many Uber drivers struggle to "bring home a livable wage," or make even minimum wage, while Uber has grown to a $60 billion capitalization and operates in nearly 500 cities around the world. Uber is an app for smartphones that connects riders with drivers. Fares are prepaid through the riders' credit cards. Riders and drivers rate each other on the app, but riders are told that gratuities are baked into the fares, so they need not even tip. Several competing ride share services, like Lyft, sprang up in Uber's wake. The named plaintiff, Lamont Lathan, drove for Uber starting in January, about 15 hours a week. But he only made $30 to $60 a week, while incurring about $60 in weekly expenses, such as fuel, car payments and repairs, according to the suit. The suit takes issue with several Uber business practices, such as deducting $1 from each fare to cover background checks and driver safety education. It also claims Uber didn't pay Lathan $6 for canceled fares, and didn't provide promised cards for discounted fuel after drivers completed a certain number of rides. The suit also claims Uber regularly overstated what prospective drivers could earn. "Talk to Uber drivers and they all have a different beef, but they all have a beef," said Brian Mahany, a Milwaukee-based attorney with a national fraud, tax and white-collar crime practice who represents Lathan. He estimates there might be 10,000 potential members of the class, but would only learn the real number if a judge certifies the class and Uber has to turn over records of its Wisconsin drivers. Uber did not reply to an email Friday to its news media contact address. The suit claims seven causes of action against Uber: tortious interference with prospective business relations, breach of contract, unjust enrichment, conversion, unfair competition, fraud and misrepresentation and violations of Wisconsin minimum wage and labor law. It seeks compensatory, punitive and treble damages and back pay, attorney fees, an injunction against the current policies and an order that Uber return to drivers any tips and fees wrongfully kept by Uber. 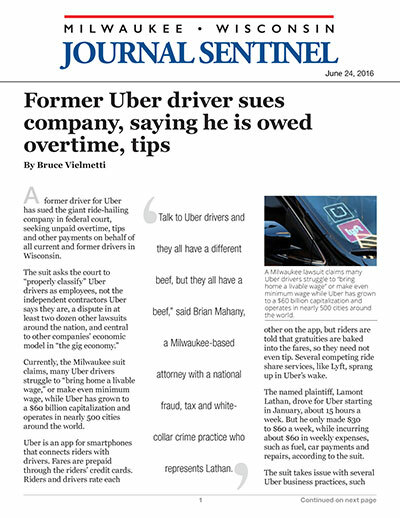 The outcome of this case and other state-specific lawsuits Mahany is filing will have a profound effect on Uber and similar companies, said Mahany. "Uber can't micro-manage its drivers' actions while at the same time trying to distance themselves from its employee drivers and Uber's obligations to those drivers by calling them 'independent contractors,'" he said. Uber has long said that because its drivers work when and as much as they want, they have great flexibility to set their own hours, like independent contractors, who must then also pay their own expenses. But the lawsuits have pointed out the many requirements and controls Uber places on its drivers as proof they are really more like employees, and should be protected by wage and hour laws, and eligible for benefits such as worker's compensation. The case comes a couple months after Uber agreed to settle a federal class-action case in California over classification for $100 million. Other suits also have been filed in other states; some were thrown out, some are pending. Mahany last month filed a suit in Chicago that would have tried to make all U.S. Uber drivers a single class, but dismissed it this week. He said a new national suit will focus on benefits for drivers, while cases in separate states will proceed much like the one filed in Milwaukee, relying in part on each state's wage and hours laws. Many drivers in California were unhappy with the settlement, Mahany said, which came after a judge ruled that a clause in Uber drivers' employment contracts that barred them from class-action suits against Uber was unenforceable. That ruling is now on appeal at the 9th U.S. Circuit Court of Appeals, which Mahany said appears to be in favor of reinstating the restriction. But the 7th U.S. Circuit Court of Appeals, which covers Wisconsin, Illinois and Indiana, in a case involving Verona-based Epic Systems, recently ruled that such forced arbitration clauses violate the National Labor Relations Act. Mahany said that fact might make the 7th Circuit ground zero for what he anticipates will be a consolidation of many of the Uber suits. "I use Uber," he said. "It's a great service. It just has not spent enough time taking care of their drivers."